Dr. Gunni (Gunnar Lárus Hjálmarsson b. 1965) is a jack-of-all-trades in the Icelandic music world. After catching a serious case of Beatlemania at the age of ten and then being baptized to the church of punk rock in 1979, Gunni has religiously pondered and listened to music, with an emphasis on his local scene. 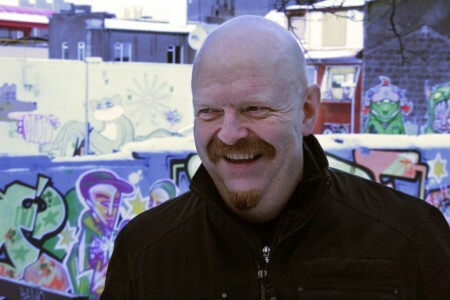 Dr. Gunni has through his career hosted various radio shows, supervised a pop quiz show on TV (Popppunktur, eight seasons already) and written about music for most of Iceland’s publications; his repertoire includes three beloved tomes on the history of Icelandic music, 2001’s “Eru ekki allir í stuði”, 2012’s “Stuð vors lands” and 2013’s Blue Eyed Pop – The History of Popular Music in Iceland, the first ever in English. Gunni has regularly performed his own music, both as solo artist and with notable local acts such as S.H. Draumur, Bless and Unun. His two children’s albums – Abbababb! (1997) and Alheimurinn! (2013) – were both very popular and included two megahits; one about farting people and the other one about the Happiest dog in the world, 2013’s most popular song in Iceland. In 2014 Dr. Gunni is working on a six episode TV documentary about popular music in Iceland (due to be aired in 2015) and writing music for a new production of Alice in Wonderland for the Akureyri Theatre company.